Vinaigrettes were popular during the late 1800s into the mid-1900s. They held a sponge soaked in aromatic liquid. A perforated cover or grill allowed the scented vapours to escape. Vinaigrettes were most commonly crafted of sterling silver. 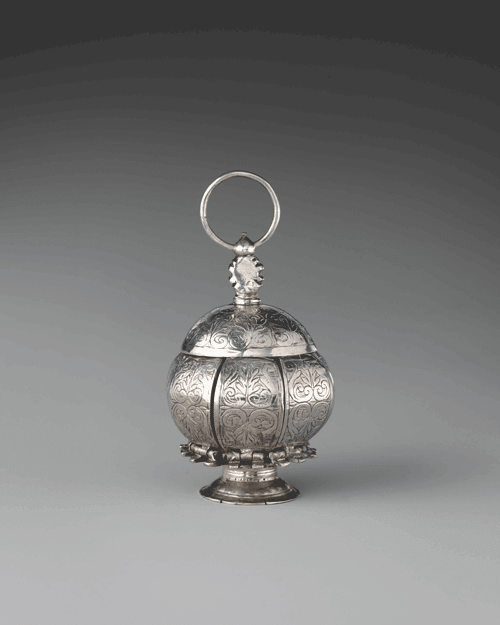 Before vinaigrettes came into vogue, pomanders were used for the same purpose. The use of pomanders dates back to the Middle Ages. The wealthy class used pomanders crafted of gold or silver to hold their fragrances. Pomanders were often decorated with jewels and shaped like fruits. They were worn on a chain as decorative jewellery. The pomanders contained substances revered for their powers against diseases like the plague. Orange rinds were wrapped up in sponges soaked in vinegar, then placed inside the pomander. King Henry VIII favoured the pounce box, which was a flat sphere made of gold or silver. It had a pierced lid and hung from a cord or chain around the waist. 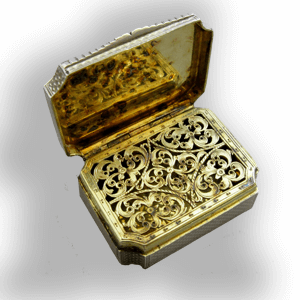 The use of the pouncet box was elevated during Elizabeth I’s reign, when the fragrance was inhaled from the box as a ritual of social manners. As aromatics became more concentrated in the 1770s, a smaller sized container became more common, and vinaigrettes took the stage. Both men and women used vinaigrettes beginning in the 1780s. By 1820 women were the primary users. Vinaigrettes were carried in pockets or worn on a chain around the waist. Women were prone to swooning from the tight laces on their corsets, and the strong aromatics inside the vinaigrette could be used to revive the senses. Vinaigrettes had hinged lids that could be flicked open for quick inhalation. Silversmiths in Birmingham produced most of the vinaigrettes. They gilded the insides to inhibit discoloration from the vinegar. Most vinaigrettes were simply designed on the outside in oval or rectangular shapes. Some have engraved or embossed decoration on the lid. Monograms were popular, featuring the initials of the giver, recipient, or both. Prominent houses and churches were featured on vinaigrettes in the 1830s. The grills often feature elaborate filigree or scrollwork. What affects the value of silver vinaigrettes? Probably the most sought-after silver vinaigrettes are novelty in shape. This example here in the form of a house would be worth upto £1000 if it came to market. 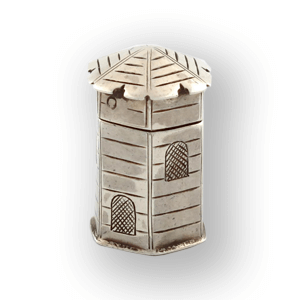 As there are so many common rectangular silver vinaigrettes on the market, collectors seek any unusual shapes. One of the most sought after group of vinaigrettes are castle top vinaigrettes. 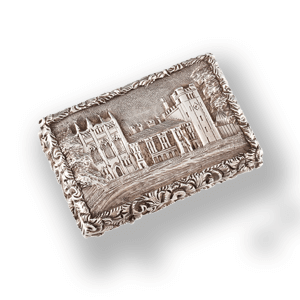 These have a view of a famous landmark die stamped onto the top and were made as souvenirs. We can learn more about castle top silver here. Combination vinaigrettes will combine the vinaigrette compartment with another function. 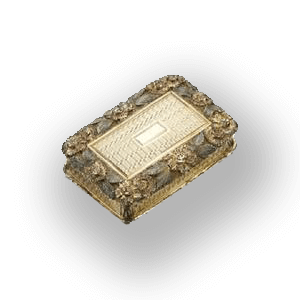 The silver vinaigrette pictured above combines a sovereign holder AND a compass along with the vinaigrette. As such it will be highly sought after by collectors. 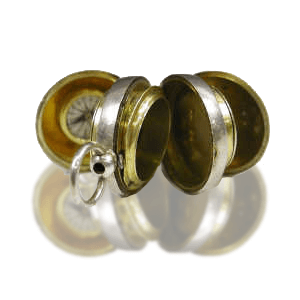 Some very exclusive silver vinaigrettes will be mounted with a micromosaic panel or set with a hardstone cover. These would have been very expensive when they were made, especially micromosaic vinaigrettes. The market is VERY good for such vinaigrettes and can make tens of thousands. 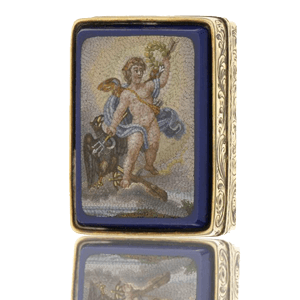 The depth of the casting and chasing of the mounts on a snuff box can have a big impact on the value of a silver vinaigrette. Those with shallow or average borders will not be too popular to collectors. However, if your silver vinaigrette has a very deep border then it will be very sought after. The grille is what keeps the sponge in place and allows the aroma to come through. If the grille is damaged or missing it will often not be economically viable to have the grille replaced. However, if it is a rare silver vinaigrette it may be worth getting the grille fixed as it will still be very desirable. If you would like a free, no obligation valuation of your silver vinaigrette please use the form below.